In the United States, the model minority myth refers to a controversial perception that Asian Americans and Pacific Islanders (AAPIs) are a monolithic subpopulation composed only of successful and affluent individuals whose children perform exceptionally well in the education system. For example, the National Center for Education Statistics’ (2016) report that AAPIs achieved the highest public high school graduation rate out of all racial and ethnic groups would appear to provide evidence in support of this myth. Despite its seemingly positive representation of AAPIs, the association between internalization of the model minority myth and negative student outcomes is well-documented in current literature. Kim and Lee (2014, 103) found that AAPI college students are less likely than their peers to seek help because “belief in the model minority myth may motivate an individual to highly value emotional self-control as a way to maintain a positive self-image of what it means to be an [AAPI].” The Obama administration has also invested one million dollars into the AAPI Data Disaggregation Initiative, encouraging state and local educational agencies to “obtain and evaluate disaggregated data on…AAPI subpopulations.” This measure was taken in response to the model minority myth often leading state and local educational agencies to collect aggregated student performance, placing all AAPI students into a single category. Consequently, poor performances of certain AAPI subgroups were less likely to be noticed, preventing students from receiving appropriate, targeted interventions (United States Department of Education, 2016). Due to these harmful effects of identifying as a model minority, ranging from influencing how AAPI students behave when challenged to preventing their access to critical resources, additional details of this myth must be carefully examined. This study thus achieves three goals. First, with regards to educational attainment and income of East and Southeast Asians, the study further highlights the dangers of AAPI data aggregation. Second, census data since 1940 is examined to clarify the historical origins of the intra-AAPI education and income gaps. Finally, the study elaborates on the current states of the intra-AAPI education and income gaps. Which AAPI Subgroups Are Least-Aligned to the Myth? The rising concern regarding the dangers of data aggregation, especially for Southeast Asian and Pacific Islander students, is corroborated by AAPI advocacy groups’ data. For example, Wilson et al. (2011, 646) found that the proportion of AAPIs with at least one year of postsecondary education rose from 42.21% in 1980 to 58.69% in 2000. However, when disaggregated by ethnicity and nationality, AAPI participation in postsecondary education tells a much different story. The Campaign for College Opportunity (2015, 11) reported that, in California, 70% of Indian Americans aged 25-years and older have a bachelor’s degree or higher. On the other hand, only 10% of Laotian Americans from the same demographic have achieved that level of education. College completion rates also differ between subgroups, as 80% of East Asians (Chinese, Japanese, South Korean) enrolled in college earn a bachelor’s degree, while more than half of Southeast Asians drop out without a degree (National Commission on Asian American and Pacific Islander Research in Education, 2011, 10). A gap between AAPI subgroups also exists in K-12 education, as Southeast Asians and Pacific Islanders tend to perform worse compared to their White and East Asian peers on standardized mathematics and reading assessments (Pang et al., 2011). Has the Intra-AAPI Gap Always Existed? Historical evidence suggests that this educational achievement gap between East Asians/Indians and Southeast Asians/Pacific Islanders may not have always been present, as all AAPI communities were subject to educational discrimination in the 19th and 20th centuries. For example, although Chinese Americans currently boast one of the highest educational attainment levels in the United States, students of Chinese descent (and other AAPIs) were subject to the 1896 “Separate but Equal” doctrine of Plessy v. Ferguson, excluded from the better-resourced schools attended by their White peers. The Chinese Exclusion Act of 1882 also identified the immigrants as “transients, whose loyalties remained with China and who intended to return there,” stripping them of their right as a citizen to public education. It was not until the Brown v. Board of Education case of 1954 that all AAPIs were fully integrated into the American public education system (Kuo, 1998). This analysis focuses specifically on two AAPI subgroups: East Asians and Southeast Asians. Data from the U.S. Census Bureau can be used to elucidate whether an educational achievement gap between East and Southeast Asians always existed or to pinpoint the moment when these AAPI subgroups began to show a pattern of divergence. Educational attainment, recorded since the 1940 census and defined as the highest level of education achieved by an individual (United States Census Bureau, 2015), can be tracked from 1940 onwards and compared between the AAPI subgroups. Income levels of the AAPI subgroups should be tracked as the model minority myth pertains to both education and affluence. Also, income data can be used to determine whether the educational achievement gap has impacted long-term life success indicators. Conclusions must pay careful attention to immigration, as the timing of AAPI subgroups’ arrival into the United States could impact their educational attainment. For example, a large influx of Southeast Asian families occurred during the Vietnam War period (Pang et al., 2011, 386). Is their relatively recent immigration a factor in their current level of educational attainment? 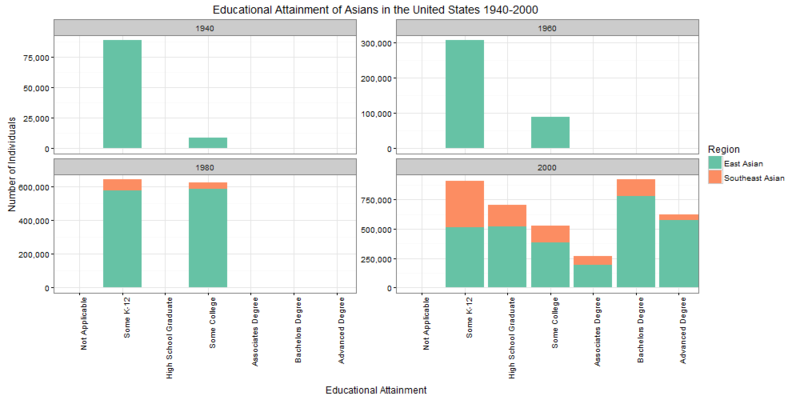 Figures 1 and 2 describe change in educational attainment of East and Southeast Asians, aged 25 years or older, in the United States for years 1940, 1960, 1980, 2000. This age range was chosen in correspondence to the age range examined by both the National Commission on Asian American and Pacific Islander Research in Education (2011) and the Campaign for College Opportunity (2015). “East Asian” is defined as those identified as Chinese, Japanese, or Korean (National Commission on Asian American and Pacific Islander Research in Education, 2011, 10). Those identified as Taiwanese or Taiwanese and Chinese are included in this category as well, due to the closely linked histories of Taiwan and China. “Southeast Asian” is defined as those identified as Cambodian, Hmong, Laotian, Thai, or Vietnamese (Campaign for College Opportunity, 2015, 6-7). For educational attainment, “Not Applicable” refers to individuals with no schooling or no record of schooling. “Some K-12” refers to individuals who have spent some time in the K-12 education system, but did not earn a diploma. “High School Graduate” refers to those with a diploma or GED. “Some College” refers to those who have spent time in higher education, but did not earn a degree. “Associate’s Degree” refers to those who have earned an associate’s degree in any field. “Bachelor’s Degree” refers to those who have earned a bachelor’s degree in any field. Finally, “Advanced Degree” refers to those who have earned a master’s, professional, or doctoral degree in any field. IPUMS 1% samples for each census year, weighted by PERWT were used to generate the column graphs. 2010 was excluded from analysis due to the lack of availability in the 1% sample. Figures 3 and 4 describe change in the income levels of East and Southeast Asians, aged 25 years or older, in the United States for years 1940, 1960, 1980, 2000. This age range was chosen for the same reasons outlined in Figure 1. “East Asian” and “Southeast Asian” are also defined in the same manner as in Figure 1. Income levels were determined by examining the individual’s total pre-tax salary or wage earned in the year prior to the census. Inflation was accounted for by adjusting the 1940, 1960, and 1980 incomes to the equivalent dollar amount in 2000 (U.S. Bureau of Labor Statistics, 2016). IPUMS 1% samples for each census year, weighted by PERWT were used to generate the column graphs. 2010 was excluded from analysis due to the lack of availability in the 1% sample. Figures 5 and 6 describe, for the year 2000, the geographical distribution of the proportion of East/Southeast Asians, aged 25 years or older, with a bachelor’s or advanced degree. This age range was chosen for the same reasons outlined in Figure 1. Proportions were calculated by dividing the number of East/Southeast Asians in a certain state, aged 25 years or older, with a bachelor’s degree or an advanced degree by the total number of East/Southeast Asians, aged 25 years or older, in that same state. “East Asian,” “Southeast Asian”, “bachelor’s degree,” and “advanced degree” are defined in the same manner as in Figure 1. IPUMS 1% samples for each census year, weighted by PERWT were used to generate the map. 2010 was excluded from analysis due to the lack of availability in the 1% sample. Code to generate the column graphs and maps can be found here. 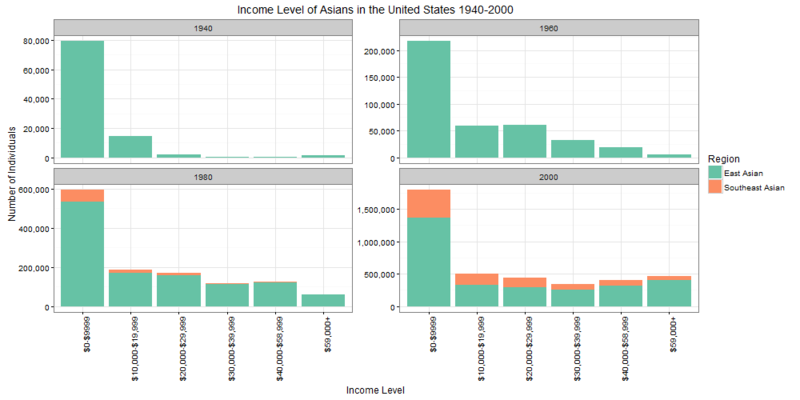 Figures 1 and 2 depict, from two different perspectives, the change from 1940 to 2000 in the educational attainment of Asians 25 and older living in the United States. 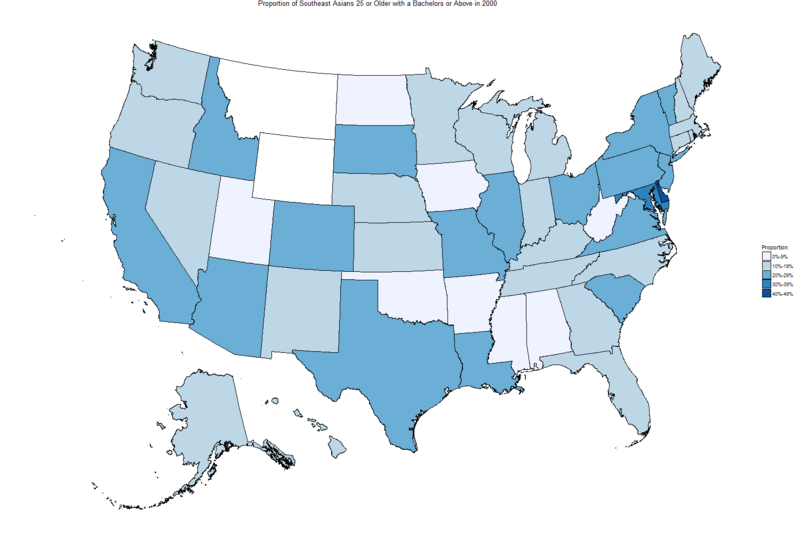 Figure 1 aggregates East Asian (Chinese, Taiwanese, Chinese and Taiwanese, Japanese, or Korean) educational attainment data together with those of Southeast Asians (Cambodian, Hmong, Laotian, Thai, or Vietnamese). Therefore, the difference between the educational attainment levels of these two groups cannot be discerned. When examining Figure 1 alone, the educational attainment of Asians overall seems to have increased over the course of the 20th century. In 1940 and 1960, a majority of Asians identified as only having some K-12 education, while a smaller proportion pursued higher education without graduating. In 1980, the number of individuals attending college experienced a rapid increase, almost reaching the number of individuals with some K-12 education. The largest change is shown by the 2000 census data, where there is no longer a bimodal distribution of Asian educational attainment between the “Some K-12” and “Some College” categories. A large number of Asians by this point are completing two- or four- year colleges, with close to 1.5 million individuals earning an Associate’s, Bachelor’s or some form of advanced degree. The absolute number of individuals categorized as “Some K-12” has increased since 1980, but by 2000, the proportion out of all Asians that these individuals take up is much less. 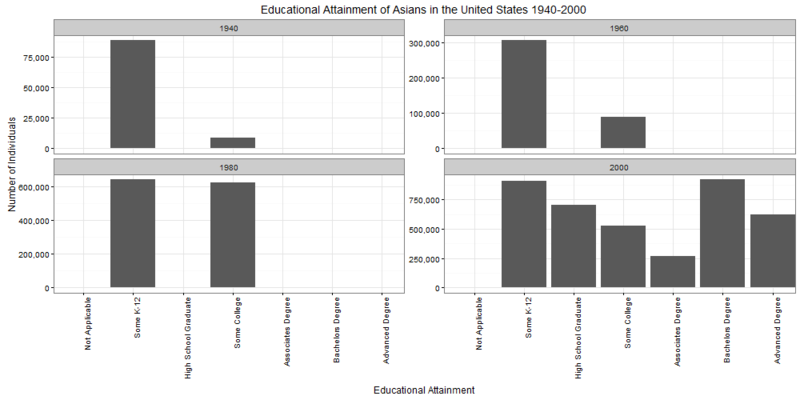 Thus, Figure 1 alone appears to provide evidence of Asians in the United States gaining increasing access to educational opportunities since 1940. However, Figure 2 tells a different story. Figure 2’s column graphs are color-coded, so that East and Southeast Asians in each educational attainment category can be distinguished. For the 2000 census data, which Figure 1 claims to show the greatest increase in Asian educational attainment, Figure 2 reveals that Southeast Asians make up only a minority of individuals that have earned an Associate’s, Bachelor’s, or some form of advance degree. “Some K-12” is the educational attainment category with the greatest similarity between the number of East and Southeast Asians. Thus, Southeast Asians tend to have lower educational attainment than their East Asian peers. Access to educational opportunities may indeed be increasing for Asians, but Southeast Asians appear less likely to be the recipients of its benefits. This pattern of educational attainment disparity between East and Southeast Asians extends the findings of the Campaign for College Opportunity (2015, 11), who report that California’s Southeast Asian population above the age of 25 are less likely to have earned a postsecondary degree than their East Asian peers. The educational attainment disparity between the two groups is not limited to California and can be applied to the United States in general. Income levels of East and Southeast Asians were also examined in addition to educational attainment as the model minority myth encompasses Asians’ financial success in addition to their educational attainment (Kim & Lee, 2014, 98). Figures 3 and 4 examine the change from 1940 to 2000 in Asian incomes (for those 25 and older). Again, the two sets of column graphs display the information from different perspectives as Figure 3 aggregates East Asian income data with those of Southeast Asians. Therefore, the difference between the income levels of these two groups cannot be viewed. 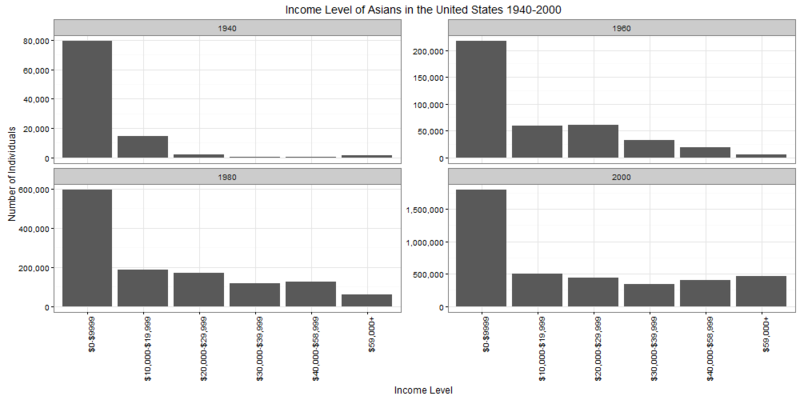 When looking at Figure 3 alone, it seems that the income levels of Asians in the United States gradually rose throughout the 20th century. In every census year, the lowest income bracket (those who earned less than $10,000 in the previous year), makes up the largest proportion. However, in 1980 and 2000, a large number of individuals earned more than $59,000 (the highest income bracket in this analysis). Thus according to this data, one may assume that the United States economy since 1940 provided both East and Southeast Asians with better-paying occupational opportunities. Figure 4, which color-codes East and Southeast Asians, reveals much more about changes in Asian income levels. In both the 1980 and 2000 census data, most Southeast Asians belong in the lowest income bracket. In each category above “$0-$9,999,” Southeast Asians make up a decreasing proportion of all individuals earning that range. Thus, Southeast Asians overall tend to have lower income levels than their East Asian peers. The dangers of Asian data aggregation, shown by Figures 2 and 4 for educational attainment and income respectively, reflect the findings of Pang, Han, and Pang (2011). In their study, aggregating the standardized test scores of all Asian American and Pacific Islander (AAPI) students skewed the data, making AAPI students appear, on average, as if they were performing better than their White peers in mathematics. However, disaggregating the AAPI data revealed that Southeast Asian students were performing worse than their White peers in the subject. Figures 2 and 4 also appear to show that both the educational attainment and income gaps between East and Southeast Asian span across the 20th century, as Southeast Asians make up a miniscule proportion of the top categories (i.e. Bachelor’s degree or above, $59,000+) in each year examined. However, there are two caveats to this conclusion. First, these graphs use absolute numbers of individuals. Therefore, it is entirely possible that Southeast Asians make up such a small proportion of the top categories because not enough individuals from Southeast Asia live in the United States. Second, not until 1990 were all nationalities or ethnicities represented in the Campaign for College Opportunity’s (2015, 6-7) definition of “Southeast Asian” recorded by the United States Census Bureau (IPUMS, 2016). Therefore, the small proportion of Southeast Asians earning postsecondary degrees or high incomes in 1940, 1960, or 1980 could be attributed to the fact that some Southeast Asians fitting into those top categories were not yet recorded for their nationality or ethnicity. Due to the shortcomings of the column graphs as listed above, more evidence is necessary to confirm that the apparent discrepancy in educational attainment and income levels between East and Southeast Asians in 2000 is not caused solely by the addition of more Southeast Asian nationality/ethnicity categories in the 2000 census. Thus, Figure 5 shows the proportion out of each state’s total East Asian population 25 years and older that have earned a Bachelor’s degree or above. Figure 6 shows the same statistic for Southeast Asians. Comparing these two maps reveals that, even when examining proportions in place of absolute numbers of individuals, there is a discrepancy between East and Southeast Asians’ educational attainment levels. Southeast Asians across the United States are less likely to have earned a Bachelor’s degree or above compared to their East Asian peers. The greatest differences occur in states like Montana, West Virginia, Alabama, and Mississippi, whereas California and Virginia exhibit smaller differences. Further research should examine the factors that contribute to the reduced gap in these two particular states. This analysis aimed to explore further details of the model minority myth, examining the educational attainment and income gaps between East and Southeast Asians since 1940. Aggregated census data perpetuate an erroneous perception of Asians in the United States, making it appear as if all Asian subgroups have experienced an increase in educational attainment and income over the course of the 20th Century. Historians would attribute this pattern to measures taken by the U.S. federal government in the mid-1900s to promote equality between the races. For example, the Magnuson Act of 1943 phased out the exclusion of Chinese immigrants into the United States (Kuo, 1998, 189), while Brown v. Board of Education of 1954 prohibited the practice of segregation in the public education system (Kuo, 1998, 182). Thus, aggregated data is susceptible to misleading the public and policymakers that Asians in the United States do not require priority in receiving educational interventions or social supports. However, disaggregated census data and the 2000 proportion maps reveal that not all subgroups have benefited from the abovementioned civil rights efforts to the same degree. Throughout the 20th century, Southeast Asians have exhibited less educational attainment and earned less income than East Asians. 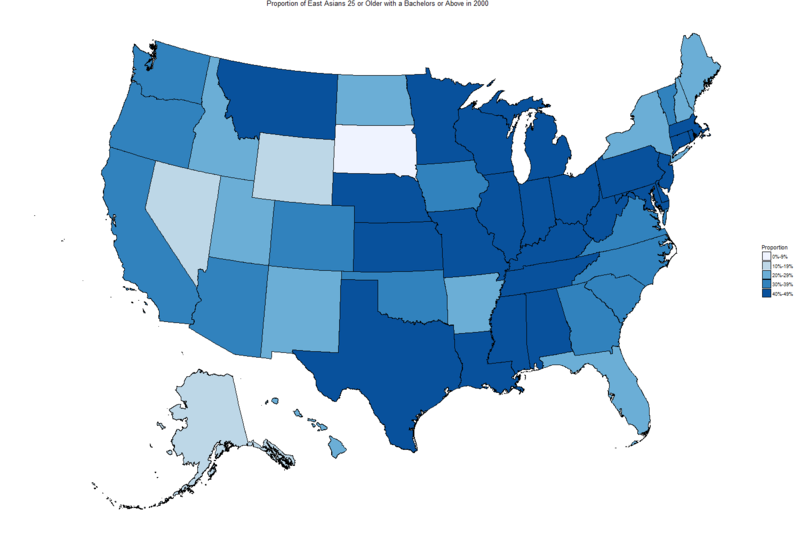 Today, in states like Montana, West Virginia, Alabama, and Mississippi, Southeast Asians over 25 are much less likely than their East Asian peers to have earned a bachelor’s degree or higher. The educational attainment and income gap between East and Southeast Asians could be attributed to the different circumstances of their immigration. Since 1975, over one million refugees from Southeast Asia, fleeing violent conditions like the Cambodian Genocide, the aftermath of the Vietnam War, and the Laotian Civil War (sometimes referred to as the “Secret War,” with reference to the United States’ clandestine involvement) have resettled in the United States, forming one of the largest refugee communities in American history (Campaign for College Opportunity, 2015, 6). These refugees, coming from a largely agrarian background, immigrated with little financial resources. In contrast, the governments of East Asian nations like China, Taiwan, Japan, and South Korea invested heavily into their economic growth during the 20th century. Thus, East Asian immigrants were able to settle in the United States with more financial resources than their Southeast Asian counterparts. In addition, these governments westernized much of their infrastructure, implementing systems like competitive-admissions high schools and postsecondary institutions. East Asian immigrants were therefore much more adapted and able to rapidly assimilate into the American education system (Pang et al., 2011, 385-386). In light of this information, further historical research should examine the impact of social status of Southeast Asian immigrants, identified using proxy indicators like classification as a refugee, occupation or degree earned in the native country, and wealth reported to the United States Customs Service upon entry, on their descendants’ educational attainment and income levels. A similar analysis should be done with reference to Pacific Islanders, who experience similar academic challenges as Southeast Asians (Pang et al., 2011, 383). Finally, policymakers are encouraged to initiate a two-fold approach in helping Southeast Asian students. First, local educational agencies should disaggregate their AAPI students’ achievement on standardized tests to evaluate whether some AAPIs in their school district are indeed performing better than other AAPI subgroups. Second, federal, state, and local educational agencies should support Southeast Asian families in navigating the American education system, assisting them in areas such as school choice, academic tutoring, and college admissions. Kim, P. Y. & Lee, D. (2014). Internalized model minority myth, Asian values, and help-seeking attitudes among Asian American students. Cultural Diversity and Ethnic Minority Psychology, 20(1), 98-106. Kuo, J. (1998). Excluded, segregated, and forgotten: A historical view of the discrimination of Chinese Americans in public schools. Asian American Law Journal, 5, 181-212. Pang, V. O., Han. P. P., & Pang, J. M. (2011). Asian American and Pacific Islander students: Equity and the achievement gap. Educational Researcher, 40(8), 378-389. Wilson, F. D., Rebhun, U., & Rivas, S. (2011). Population change and changing educational attainment of ethnic groups in the United States, 1980-2000. Population Research and Policy Review, 30(4), 639-659. This entry was posted in Uncategorized by Ji Soo Song. Bookmark the permalink.